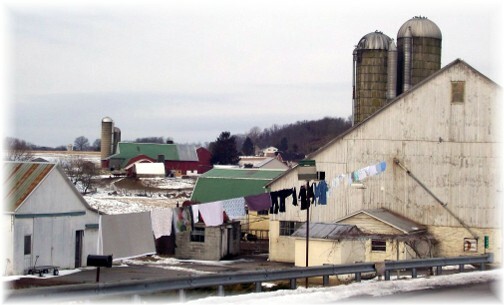 We pass this Amish farm in southern Lancaster County. We consider what it must be like to hang wet clothes on the line when it’s below freezing (although Brooksyne reminds me that she did so until she left home for college)! “She hath done what she could” (Mark 14:8a). Yesterday we had an interesting service in our church as Debi Irene Wahl portrayed Fanny Crosby and her mother portrayed Fanny’s grandmother. We were reminded of the outstanding and ongoing contribution that one person can make to the Kingdom of God. Interestingly, Fanny was blind, but God gifted her with an extraordinary ability to write inspirational, Bible-based poetry which became texts to many of the hymns we continue to sing today, such as “Blessed Assurance”, “Tell Me the Story of Jesus” and so many, many others. Many readers in this encouragement series have heard of Fanny Crosby. She died in 1915 but her songs continue to be sung in churches all around the world. 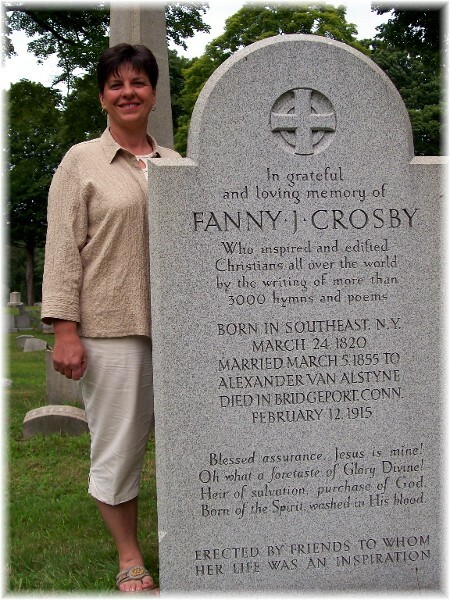 Several times I have posted a photo of Brooksyne standing beside Fanny Crosby’s more recent tombstone in Bridgeport Connecticut. However the original tombstone placed at the time of her death simply stated, “She Hath Done What She Could” which is actually a Scripture quotation from Mark 14:8, our daily text. Fanny Crosby became blind at six weeks of age due to human error. In addition to that tragedy her father died while she was still an infant forcing her mother to go out and find full-time work. Fanny’s grandmother took over the very difficult job of raising a blind child and did so as she taught her in the ways of the Lord. Over time Fanny memorized entire books of the Bible. As she grew in her faith the Holy Spirit enabled her to express in prose that which she had learned from Scripture and from her experiences in life as she walked in the ways of holiness. As a young mother she gave birth to a child who lived for only a short time. In her oral biography she said, “God gave us a tender babe,” and “soon the angels came down and took our infant up to God and His throne.” She privately bore the sadness of her loss and did not speak of it publicly, though it is likely reflected in a number of her songs that express her desire to be in heaven where she wrote that we are “free from the blight of sorrow, free from my doubts and fears; only a few more trials, only a few more tears.” (Taken from the hymn, “Safe in the Arms of Jesus”). I’m so thankful Fanny didn’t wallow in regrets or torment herself with the defeatist mind game, “What if?” Instead, she did what she could for the Lord. God mightily blessed it, and scores of generations have benefitted from her obedience. In our Scripture text, Jesus is speaking of the woman whom the disciples scolded for pouring an alabaster box of very expensive perfume on His head. In response to their harsh rebuke He commended her actions by saying, “She hath done what she could.” The disciples gave their opinions regarding the different ways that this perfume could have been used in a more cost-efficient manner. They felt that her wasteful act of generosity was way over the top. Perhaps she sold a treasured possession to purchase the perfume. However she obtained it, she gave every last drop unreservedly to her Master. Jesus commends her act and her story reminds us that He is very pleased when we give our all. So often we give Jesus the left-overs of our time, our labor, our devotion, and our finances whereas He desires the first fruits. He wants to be our “first love” since otherwise our hearts are prone to wandering after worthless pursuits. We can live our life for self or in consecration to God’s purpose. Recall the old saying, “Only one life will soon be past, only what’s done for Christ will last.” Consider that famous quote in light of the woman (Mary) who wanted to bless her Savior in an extravagant way. She exemplifies better than anyone the unreserved dedication that all believers should have. Mary’s act was the expression of her deep devotion and profound love for her Master. As a result the Lord ordained that her story should accompany the preaching of the Gospel, ”in memory of her” (14:9). In the end the disciples who had just rebuked Mary harshly for her “waste of perfume” were now the ones being rebuked. I ask you today as I also ask myself: “Am I doing all that I can for the kingdom of Christ?” If so, I am building a memorial of faith as Christ is exemplified in that which I do. Just as Jesus said it of Mary, “She hath done what she could” may He also say it about us. Daily Prayer: Father, we can live in such a way that our limitations define us and guide us in all that we think, do, and say. Or we can recognize that our abilities are not restricted when You accomplish Your will in our lives. The constraints we place on ourselves can be lifted by the power of Your Holy Spirit as we give You all that we are and fully devote ourselves to You and Your service. Let it be said of us, “They did what they could to honor Christ”, in whose name we pray. Amen. 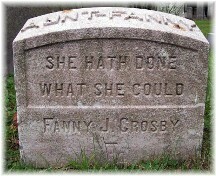 Can you think of another tombstone that has the phrase “She hath done what she could”? I will share the answer of one tomorrow with a photo. The daily message and prayer on Facebook. The daily message and prayer on Twitter. I tend to be a slow learner with these types of programs so please pardon me if I didn’t set this up right and I welcome suggested improvements as to utilizing them better. 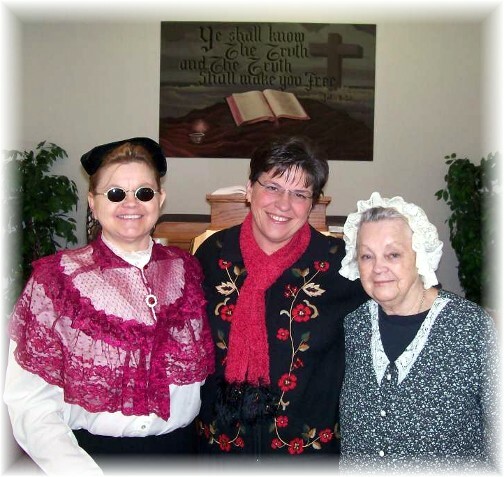 Brooksyne (middle in photo) along with “Fanny Crosby” and her “grandmother”. Ray and Vicky Mancini (left in photo), long time friends from New Jersey, stopped by yesterday to visit, along with their friends Stewart and Debora McCloud from Long Island. 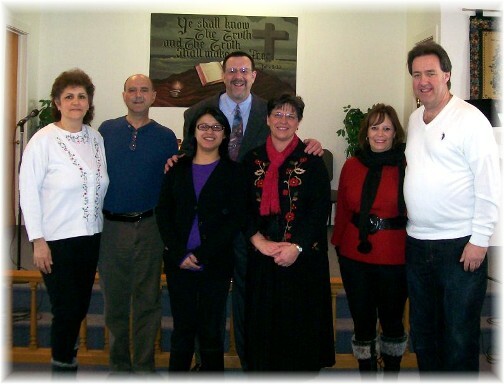 They were visiting here in Lancaster County and decided to visit our church. I met Stewart for the first time and engaged in a conversation with him about where he worked. He offered that he worked on the Long Island Railroad. A friend, George Summers, who was in our church in northern PA about twenty-five years ago had moved to New York to work for the Long Island Railroad. Like my Mom would always said, “It never hurts to ask” so I asked Stewart if he knew George and, amazingly, he did! Now that is an extraordinary conincidence since the Long Island Railroad has 7,000 employees. Yesterday afternoon we visited with Joe and Beulah Snavely and their daughter Kelsey who worked with our youth these last seven months. 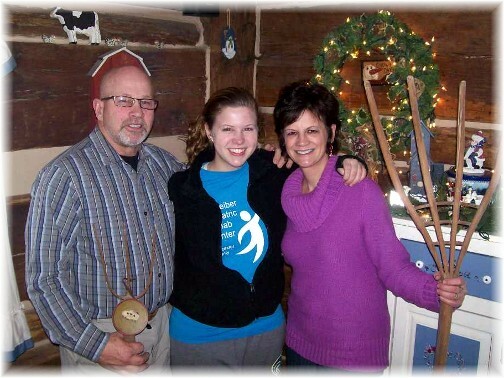 Kelsey is departing this week for Costa Rica to attend a Bible College for a year. 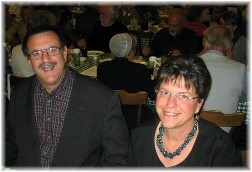 The Savely’s live in a farmhouse over 200 years old which has been in their family at least six generations. They have lots of neat antique farm implements around their house. I asked them to stand holding the pitch forks, trying to get them to strike a pose like American Gothic! Note: Joe is not wearing a barn-shaped cap, it is on the wall! 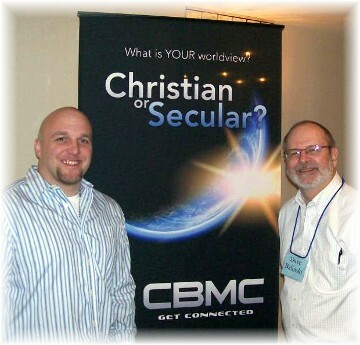 I am involved in an organization called CBMC, a fellowship of local businessmen committed to serving Christ. Dave Balinski, on the right in the photo, is our regional CBMC leader and Joe Rose, a football payer, shared his testimony at the meeting. That’s a good question on the banner! Click on the link to open and play. “Lord, I Offer My Life To You” Video Long intro but great lyrics and worth the wait! “Little Is Much” Video Ernie Haase & Signature Sound Outstanding harmony! This song fits so well with today’s theme. “Blessed Assurance” Video Harpeth Gospel Quartet Yesterday we learned that this song has been translated into more languages than any Christian hymn except for “Amazing Grace”. “To God Be The Glory” Video (Musicians not identified but this sounds like good congregational singing in a local church.) An interesting bit of hymn trivia is that this song was not popularized until Cliff Barrows led this song in worship in a Billy Graham Crusade held in London in 1954. It turned into a three month crusade as revival was spreading througout Great Britain and “To God Be the Glory” became the nightly theme song. Send a message to Stephen & Brooksyne.